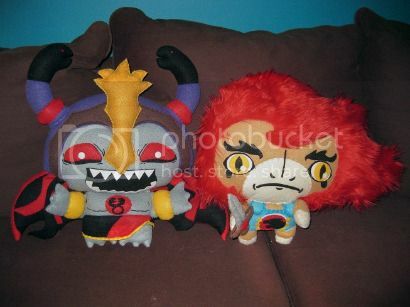 Nathan at PopHate commissioned these Lion-O and Mumm-Ra plush dolls from prolific plushie artist Chelsea Bloxsom. Mumm-Ra appears delighted to have been rendered adorable, and Lion-O… not so much. Via Super Punch, who’s largely indifferent to his adorableness.